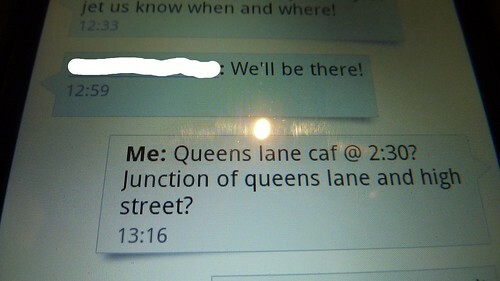 The message about meeting at 2:30 was sent before the one reading “We’ll be there!”, yet appears subsequently. We all know that time stands still in Oxford, but -- runs backwards?! It had me flummoxed for a second or two but actually there is a perfectly rational explanation. You might like to ask your pupils if they can figure it out – or write a story based on the assumption that the display of messages is perfectly accurate. 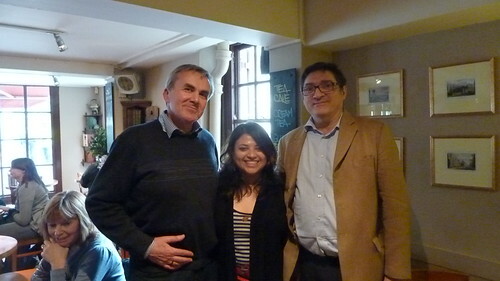 Anyway, here’s a photo to prove we did meet after all – and it was the first time Clive and I have met in real life, having followed each other on Twitter for ages. There are more pictures of Oxford, but at the time of writing they hadn’t finished uploading.